The Library was started as a library for erstwhile I.P.G.S.R. on a spacious floor in the Academic block on the Main Campus of the JNT University at Masab Tank, Hyderabad. It was upgraded as the University Library from 1990. In the year 2004, the University Library was shifted to a new building of 45,000 Sq.ft area extended in 3 floors at Kukatpally Campus. The University Library was named after the first Vice-chancellor of JNT University as T R Doss Bhavan. 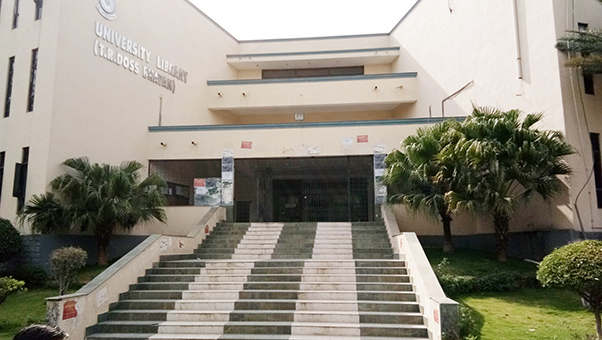 The University Library is catering the Information needs of nearly 4000 UG, PG, and Research students along with the teaching staff of the following University Institutions, Institute of Science and Technology with 7 departments, JNTU College of Engineering Hyderabad with 13 departments, School of Information Technology, School of Management Studies, Academic Staff College, Research and Development Unit, University Foreign Relations Cell and School of Continuous & Distance Education. The University Library with a seating capacity of 500 Nos. acts as a key learning resource centre of the University to meet the information needs of the academic community, fostering self development, fulfilling the curriculum requirements and promoting studies and research. The University Library is well equipped with modern facilities like electronic resources in the form of online databases, e-journals, e-books, standards, theses and dissertations and also in the form of print form of books, journals, reports, etc. The University Central Library was fully automated with bar coding of the books through VTLS-Virtua Library Software. The main features of the VTLS Software are OPAC, Acquisition, Cataloguing, Circulation, Serial Control and, the Digitization of the content of the books. A well equipped Digital Library is one of the most important sections of the University Library. In the process of providing modern and better facilities for the users the Digital Library section was upgraded with 2 Nos. of IBM x3650 M4 Servers for the SUN Servers and user access new Desktops 100 Nos. for SUN Thin clients. The Library has enhanced the dedicated leased line connectivity from 10 MBPS to 20 MBPS under NKN/NME-ICT Programme. All the systems are connected to the campus-wide LAN, thus enabling the users to access the online resources from their respective desktops. Wi-Fi facility with Electrical Power points is enabled in University Library for benefit of students and staff. This system will help the users in accessing the e-resources in the library smoothly who are having personnel laptops. The setting-up of ETD lab and Digitization of the Ph.D theses and uploading it into Shodhganga is under process. The University Library is a member of the e-ShodhSindhu: Consortium for Higher Education Electronic Resources, UGC-INFONET, INDEST-AICTE Consortium, INFLIBNET, DELNET and provides IP based online access to full text e-resources including University funded online journals. University Library provides access to High Quality Learning Material (Video Lectures) of NPTEL Content (800 Courses from 17 Departments) in the University Library. All the e-resources of the University Library are also accessible through 'FED GATE Database' a federated search tool, which enables users (students, scholars & faculty) to simultaneously search in real-time through multiple information resources/articles from a single platform. The newly established Competitive Examinations Reference Library (CERL) on 2nd floor of the university library provides exclusive services to students preparing for competitive examinations like UPSC/Civil Services/ Group-I/ IES/ GATE, etc. with a separate books collection & magazines/periodicals and also a Personal Books Reading Room in Ground Floor for the students to read their personal materials and books. For the security of books from theft, the University Library is equipped with Surveillance system on all the three floors with 48 Nos. of Colour dome cameras with 2 Nos. of LED TV's, DV Recorders having 2 TB storage capacity for effective surveillance on all the important locations of the Library and also with 3M EM (Electro-magnetic) Library Security System, ensuring that no material leaves the Library without being properly issued /checked out. Building: 45,000 sft plinth areas extended in 3 floors. Ground floor: Circulation and Lending section, General issue books Stack Area, Reading room, Personal books & Newspaper reading room, Reprography facility, OPAC, Property counter, ramp for differently- abled users, Lift, Conference Hall with a seating capacity of 50, staff rooms, user terminals, Staff terminals, and UPS room. First floor: University Librarian chamber, Administrative section, Journal/Serial section, Reference section, Back volumes of Journals, Thesis, ETD Lab, Xerox room, Audio Visual room, OPAC, Staff rooms, user terminals, Staff terminals, and UPS room. iii) Digital Library software: VTLS - VIRTUA Software (Virtual Library System), Integrated Library Management Software Solution (ILMSS) with unlimited user access for - 10 users Oracle 9i license. LAN is developed throughout University Library (Three floors) with CAT 6 Cable, with 4 CISCO Switches, with 24 ports each of 96 nodes and 1 Router. Digital Library facility available on the 2nd floor of the University Library. The circulation counter is equipped with 2 Nos. of Motorola LS 2208 hand held scanners for issue and return of the books. Surveillance system on all the three floors with 48 Nos. of Colour dome cameras with 2 Nos. of LED TV’s, DV Recorders with 2 TB storage capacity. 3M EM (Electro-magnetic) Library Security System, ensuring that no material leaves the Library without being properly issued /checked out. Photo Colour ID-Card printer was installed in the University Library to issue Photo Identity Library cards (PVC) for students, staff, and researchers. Setting-up of ETD lab and Digitization of the Ph.D theses and uploading it into INFLIBNET Shodhganga is under process. Digital Library Services available on the 2nd floor of the University Library. Photo Identity Library cards issued to students, staff, and researchers. One conference room with 50 seating capacity, equipped with LCD Projector, 60" X 60" motorized screen. The University Library extends Internet facility to the students, staff, and researchers for their literature search and document retrieval. Library Timings: University Library is open throughout the year except on General Public Holidays. JNTUH Campus Students must show their Identity Card at the Main Entrance of the University Library. Students without Identity Card are not allowed inside the Library. Outside students including Course completed students (UG/PG) of SIT, IST, SMS, and JNTUH CEH are NOT ALLOWED inside the University Library. All the students should take Library membership by payment of (UG & PG Rs.500/- and Research Scholars Rs.5,000/-) as Library Security deposit (refundable). Payments should be made by Demand Draft, drawn in favour of “The University Librarian, University Library, JNTUH", Payable at Hyderabad. This library Security deposit is refundable upon completion of the student’s course at the University Library. Outside books/ reading material/Mobile/Cell phones/ valuable items, etc. are NOT ALLOWED inside the University Library. All the students are advised to keep their personal belongings, such as attaché cases, brief cases, satchels, bags, umbrellas, etc, books not belonging to the University Library and books though borrowed from the library but not meant to be returned to the library, shall be deposited at the Property Counter at the entrance to the library and obtain a numbered token. If the token is not returned their belongings will not be returned. It is advisable not to bring valuable things to the library and deposit them at the Property Counter. The University Library does not accept any responsibility for any damage or loss of items/ valuable items ie., (Cash, Gold ornaments, Laptops, Calculator, Digital diary, Mobile phone, credit card, etc.) inside their bags kept at Property Counter or inside the University Library. Housekeeping persons : 3 Nos. Hyderabad– 500 085. Telangana State. It is the responsibility of individual users to ensure that the use of electronic resources does not breach the terms and conditions specified in the license agreements. NOTE: Breaches of the license agreement with publishers could result in the suspension of access to the resources for the member institutions. Generic license agreements for all publishers specifying all the terms and conditions are given above.